In February, Coca-Cola made a big announcement that Diet Coke lovers had maybe, possibly been waiting a long time for — that the top-selling low-cal cola would now be available in frozen form as something called Diet Coke Frost. But after only a few weeks of having trouble getting the stuff to freeze properly, 7-Eleven has pulled the plug on its exclusive, cherry-flavored version of Frost. A rep for the convenience store chain tells AdAge.com that a “significant” number of stores had problems getting the Diet Coke Frost mix to firm up to the high standards that all of humankind has come to expect from 7-Eleven Slurpees. “In keeping with both companies’ quality standards, 7-Eleven has decided to remove the product,” explains 7-Eleven, before getting back to rotating the Big Bites that are heating up on the hot dog machine. Coke-flavored Slurpees have been around since the dawn of man (well, at least since the dawn of yours truly), but Diet beverages have generally eluded the 7-Eleven Slurpee machines because they lack the sugar that help give sweeter frozen drinks their structure. Obviously, some sugar was added to the Diet Coke Frost Slurpee formula, as it had 30 calories per 20 oz. serving, many times more than you’d get from drinking a regular old, non-frozen Diet Coke. What remains to be seen is whether this is the true death of Diet Coke Frost, or if it will be resurrected after Coca-Cola’s mad scientists solve this cold conundrum. 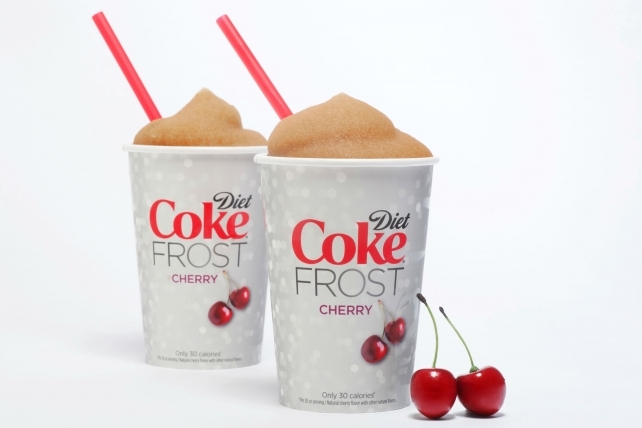 Additionally, we’re not sure what the 7-Eleven decision does to Coke’s decision to roll out non-cherry Diet Coke Frost to other sellers. That roll out had initially been slated to begin in May.